Are you looking to build a barn on your Norman, OK property? We can help! D Cross Barn Co. has over 35 years of construction experience, and we would love to build you the barn you need! 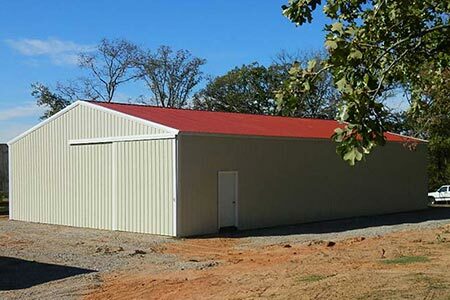 Whether you need a new workshop or garage, sleeping quarters for your horses, a place to store equipment, or want a new barn building for any other reason, D Cross Barn Co. can build it for you! Don’t settle for second-best in barn builders! Tempted to buy a DIY barn kit? It may be cheap, but without professional construction experience and specialized equipment, it is not a good idea. When in doubt talk to the pros at D Cross Barn Co. first – we have decades of experience in constructing beautiful Norman, Oklahoma pole barns. With a little planning we can build you exactly the pole barn you are looking for and eliminate most of the headaches! We pour our own concrete slabs and driveways. Many companies will make customers fend for themselves when it comes to pouring concrete. We do it ourselves, saving you time and energy, and ensuring that the slabs and driveways are exactly the right size and shape for your custom barn. Along with the standard designs and layouts we provide, we also build custom barns that you design yourself! If you have creative, unique ideas that you want for your building, we can make it happen! We also offer an array of custom features such as insulation, skylights, cupolas, windows, among others, that you can choose to add to your barn. D Cross Barn Co. is experienced in all types of construction. We also build gymnasiums, churches, cabins and houses! If you’d like a barn or any other building built, contact us today at 1-866-749-7627 or 918-805-7512 and we can give you a free, no-oligation barn construction consultation!